In this paper, we introduce and study a new task of figure retrieval in which the retrieval units are figures of research articles and the task is to rank figures with response to a query. As a first step toward addressing this task, we focus on textual queries and represent a figure using text extracted from its article. We suggest and study the effectiveness of several retrieval methods for the task. We build a test collection by using research articles from the ACL Anthology corpus and treating figure captions as queries. 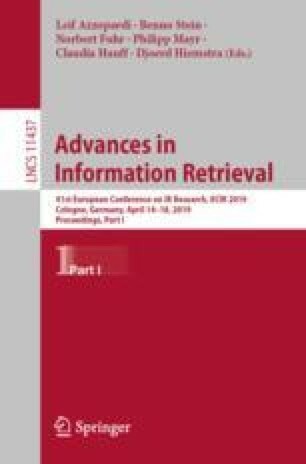 While having some limitations, using this data set we were able to obtain some interesting preliminary results on the relative effectiveness of different representations of a figure and different retrieval methods, which also shed some light regarding possible types of information need, and potential challenges in figure retrieval. We thank the reviewers for their useful comments. This material is based upon work supported by the National Science Foundation under Grant No. 1801652.